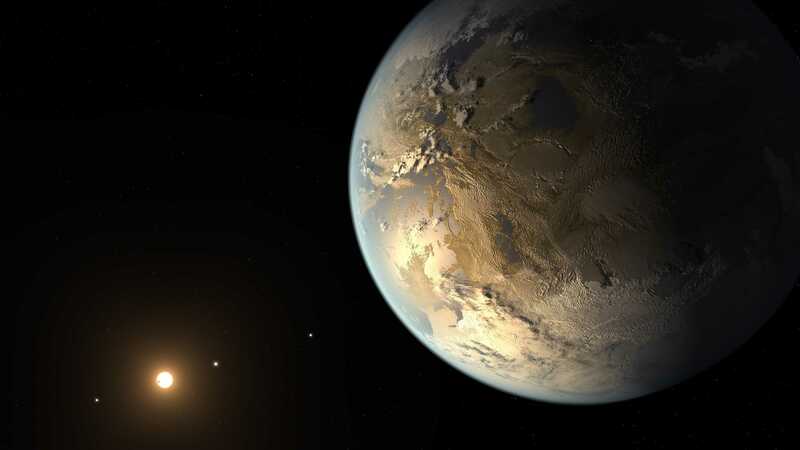 An artist conception of what the system around Kepler-186f could look like. Credit: NASA AMES/SETI INSTITUTE/JPL-CALTECH. Although we’ve yet to find life outside planet Earth, astrobiology has certainly come a long way in the past decade alone. Our once crude assumptions are now more finessed and, thanks to the Kepler Space Telescope, we now know of thousands of exoplanets, some potentially habitable and only a couple light-years away. Bearing recent developments in mind, a new congressionally mandated report from the National Academies of Sciences, Engineering, and Medicine outlines some of the key steps NASA needs to take in order to bring alien hunting to the next level. The 196-page report starts by making a point of the fact that recent scientific advances have provided opportunities to strengthen the role of astrobiology in NASA. For instance, NASA’s Curiosity rover and Mars Reconnaissance Orbiter (MRO) have found evidence of organic molecules, atmospheric methane, briny surface water, and even an underground Martian lake filled with liquid water. Elsewhere, on Saturn’s moons Enceladus and Europa, scientists found evidence of plumes that shoot up hundreds of miles and which contain water and other organic compounds. In fact, it’s Europa — and not Mars — that is the most promising place where scientists think we’ll find life outside our planet. It was also recently that biologists found strange Earth lifeforms which live deep underwater or underground, with no direct contact with the sun’s energy input. This means that life may be less capricious than once thought. In particular, the authors of the report call for NASA to focus on exploring the possibility of finding life below the surface of a planet or moon. They also recommend that NASA seeks to deploy better technologies, such as powerful telescopes and starlight-blocking instruments capable of more complex probing of alien planets. But accurately finding and interpreting biosignatures will be a challenge. For instance, many biosignatures can be produced by abiotic chemical reactions. Methane is often touted as an important byproduct of biological activity, but it could very well be produced by non-biological processes. The report is also careful to mention how such an ambitious mission is actually a planetary goal. NASA needs to build or strengthen collaborations with other institutions and private organizations, the authors note. Along with a similar survey of exoplanets released last month, the new report will be included into two decadal surveys covering astronomy, astrophysics, and planetary sciences. These decadal surveys ought to form the backbone of NASA’s decision-making process about which missions to pursue or prioritize.